Most people will always associate singer Chris Cornell with the hard rock sound he made with his band Soundgarden. But over the years, Cornell has incorporated different styles in his own solo work — such as pop and hip-hop elements — while still maintaining his distinctive gritty and stirring vocals. Now the artist is adding another new wrinkle to his career: Acoustic music. 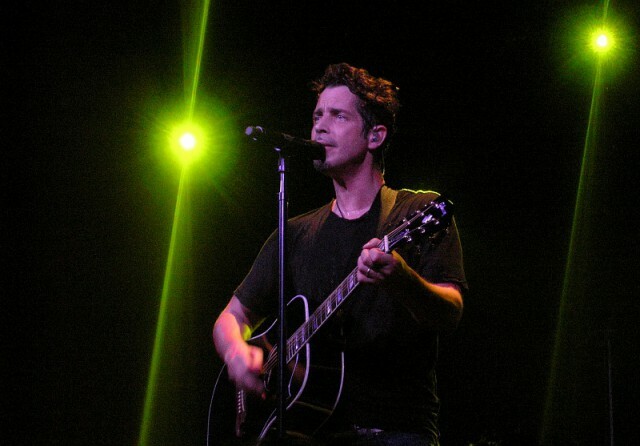 This past spring, Cornell did an unplugged tour, performing music from his solo career as well as his work with Soundgarden, Audioslave and Temple of the Dog. A collection of those live songs make up his new record, ‘Songbook,’ which includes the haunting and melancholy ‘Cleaning My Gun,’ a track that has never been appeared on any of his albums. Cornell recently embarked on the second leg of his ‘Songbook’ tour that runs through Dec. 17. Following the completion of his solo dates, Cornell and the other members of Soundgarden — who are finishing their first new studio album in about 16 years — will tour Australia starting Jan. 20. In an exclusive interview with Spinner, Cornell talks about the motivation behind going acoustic, the new material on ‘Songbook’ and the latest news on Soundgarden. Where did the idea of ‘Songbook’ come from? After I had written and recorded the song ‘Seasons’ that ended up on the ‘Singles’ movie soundtrack. Surprisingly it did well and got a lot of airplay. People played it and liked it. It wasn’t really even written for any particular purpose — [‘Singles’ director] Cameron Crowe just heard it and wanted it in his film. That led to some other things. I did an acoustic version of a Soundgarden song, ‘Like Suicide,’ for a film because they asked for something like that. When I was first started thinking about doing solo work and started [my first solo album] ‘Euphoria Morning,’ I’ve definitely heard from fans and a lot people have asked me, “So you’re gonna make an acoustic record, right?” I didn’t do that, but I always felt like someday I’ve got to make good on that promise. The first tour that I did around the U.S., it took about five shows before it kind of revealed itself. It became something really special where the fans were totally participating from the beginning of the show to the end. I rarely followed the set list. So, I’m playing songs as they’re called out. It has turned into something amazing, which is why I wanted to release the record. Does this approach make you see your songs in a new light? For me personally, maybe there’s an ability to be more emotional. I don’t think that makes as much difference to me as it does to the listeners. That’s because for me, they’re my lyrics, I wrote them, I’m singing them. So even in the context of, for example, a Soundgarden or Audioslave show where it’s very loud and there’s a lot of competing with the singing, it’s kind of competing with focus on what’s being sung. For an audience member, that competition is much more difficult to deal with than it is for the person singing it — I know what I’m singing. So when it is stripped down as it is for an acoustic show, I think there’s a different focus entirely. I noticed that when Johnny Cash did a version of ‘Rusty Cage’ [from Soundgarden’s 1991 album ‘Badmotorfinger’] and I was getting phone messages about how great the lyrics were. I’ve never gotten those messages before. The Soundgarden version was this very aggressive, uptempo, sonically sort of screeching song. You kind of had to focus on listening to the lyrics if you wanted to know what they were. When Johnny Cash did it, it was a very simple Tennessee Three kind of shuffle with his huge voice over it and people focused on it more. That’s also what happened when I did my version of Michael Jackson’s ‘Billie Jean.’ His version was very much a rhythmic dance track with this dance beat and this very big, memorable bass line. When I did my version of it, I think people heard it differently — I certainly did. I’d initially done that as a sort of joke that I was going to play on the other members of Audioslave when I had my little acoustic moment. But when I changed it to a 3/4 gospel time signature, slowed way down, added a chord where there wasn’t before, and started singing it, it wasn’t funny anymore. It became this very serious lament. I realized the lyrics were very serious. There was a vivid story and it was very good storytelling. It’s a song that’s well written and timeless and it’s very nimble, you can do a lot different things. Talk about ‘Cleaning My Gun,’ which marks the first time it has appeared on an album. I got a few songs like that over the years, in the last eight to 10 years of my career where the occasion didn’t arise to put it on anything. That song in particular I played live and kept doing it because of the response of the fans. I kept seeing it was sort of moving the needle a little bit with the audience. It was based on the concept of this running joke that I used to have with a friend of mine when I used to work at a restaurant. It’s a joke about when somebody was feeling suicidal and went home and sort of pretended they’re cleaning their gun and blow their head off. It was a metaphor for somebody who was in a bad way or a bad mood or feeling depressed. I remembered that and felt it would be an interesting approach to writing a lament like that — somebody who was down and out, and in that mood without necessarily using those words, without spelling it out. There are two songs that you performed from Temple of the Dog’s 1990 self-titled album, ‘All Night Thing’ and ‘Call Me a Dog.’ Have you performed Temple of the Dog material throughout your career? I’m not sure actually if I did anything from Temple on the ‘Euphoria Morning’ tour. On my ‘Carry On’ tour, which was a couple of years back, we did a couple with a full band. But as I said, in doing acoustic sets, I figured out how to fit more and more of them into the set. There are songs that I wrote a long time ago that have never really gotten much live play. Most of the record lends itself really well to acoustic performance. ‘The Keeper’ comes from the soundtrack to ‘Machine Gun Preacher.’ Did you work on the song prior to the movie? That was specifically written for the movie — reading the script and talking with the director. It took me a while to get an angle on it because of the subject matter of the film. It’s based on a story [about Sam Childers] and the orphans in the Sudan where he was there and still is there risking his life to protect [them] from unimaginable horrors. It was difficult to find an angle because I am not those children. I haven’t had that experience. It ended up being an angle of just trying to imagine Sam Childers as Woody Guthrie writing a song dedicating his life to these kids. That’s sort of where the idea came from, that approach to that song. You’re also going to be touring with Soundgarden after the ‘Songbook’ tour. I think in the year that we’re going to finish up our record — and it’s gonna come out in the spring — we’ll be up and supporting it. We’re also going to Australia for a couple of weeks. How has the recording of it been? It’s great. It’s probably three quarters of the way there. Will it be similar or different from the previous Soundgarden albums? I think it’s just a natural progression. It’s certainly not nostalgic or retro. I don’t see it at all as Soundgarden going back to their roots. I don’t even know what that would be. Soundgarden has always been so eclectic. To me, it’s a continuation or in a sense it’s almost like picking up where we left off.